Cambridge O Level Principles of Accounts has been designed specifically to meet the requirements of the Cambridge syllabus. 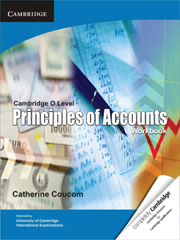 Cambridge O Level Principles of Accounts Workbook has been written specifically for the Cambridge O Level Accounting syllabus. 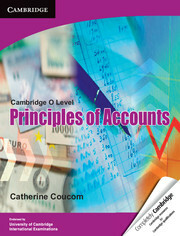 This book can be used in conjunction with the Coursebook Cambridge O Level Principles of Accounts written by the same author, but may also be used independently. This book applies international accounting terminology. Endorsed by Cambridge International Examinations. Guidance on preparing for the examination and techniques for use within the examination room. Templates for all the main types of final accounts (including the use of ‘new’ terminology). Exercises on accounting terminology and definitions. Demonstration of how to attempt three-structured exam-type questions. Review questions covering the whole syllabus. Summarised answers for most of the review questions. Online resources for teachers and lecturers.